However this is the version without Dustin Hoffman and Anne Bancroft. I'm not certain but I think it was only yesterday that Annelise marched her little ol' self into kindergarten (well, the paparazzi--AKA moi--went with her). At least it feels like yesterday. 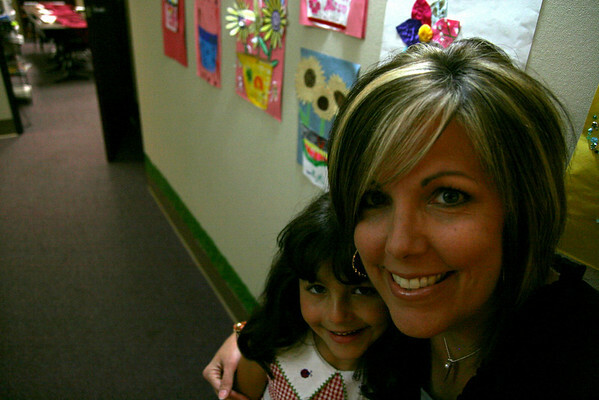 Exactly WHO has given her the green light to grow up and finish things like Kindergarten? Last night the stars must have been in perfect alignment because we got to the school early enough to save really good seats in the second row* and take a few photos before things got under way. Annelise and her friend Z. showed how they are 87% of the time... We posed for a quick hallway self portrait with The Graduate (we missed getting one with Scott who was busy saving those seats, thanks babe). 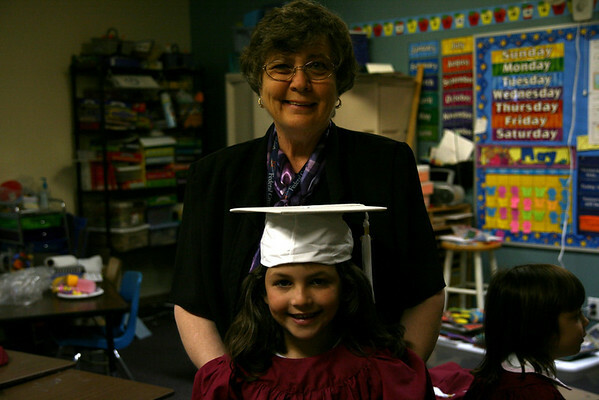 Here's The Graduate with her sweet teacher. 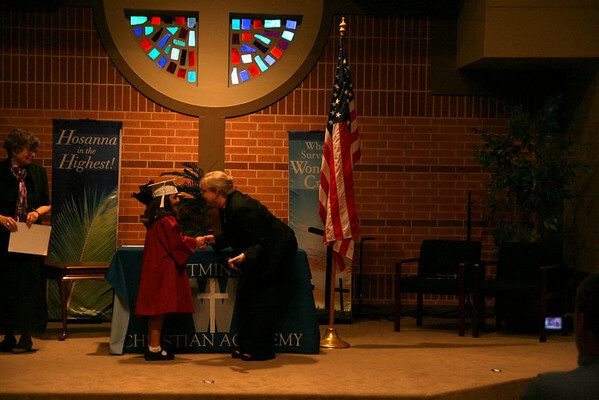 Then, in the blink of an eye, our little girl was walking across the stage, shaking the Headmistress' hand and getting her diploma. All the other graduates paused for a moment at the edge of the stage for a photo op. Not our Annelise. She walked right down the steps, ripped her cap off of her head and sat back down. So much for posterity, pomp and circumstance. 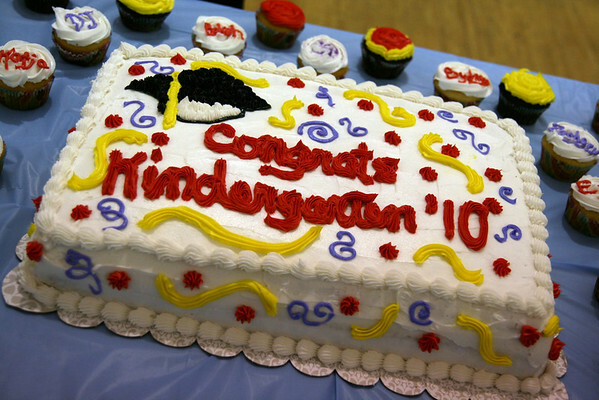 However, The Graduate could NOT ignore the right of passage otherwise known as cake. Especially once she saw her name took up TWO cupcakes instead of one like all the other graduates. 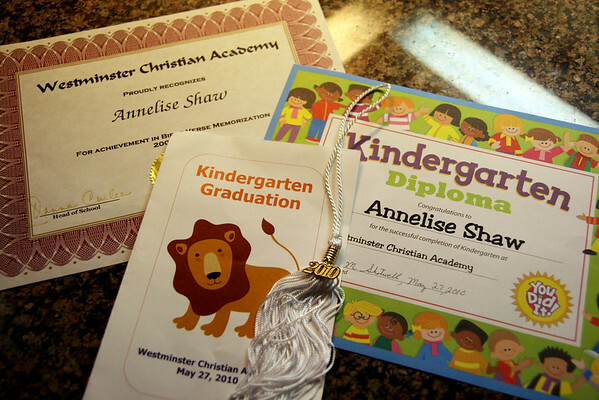 Since a ceremony like graduation signals, oh, I don't know, the END of the school year, I had to put the finishing touches on Annelise's gifts for her teacher. Okay, I actually finished approximately 2 minutes before leaving the house this morning to go to school. Procrastinate much? This year I helped Annelise write an acrostic poem about her teacher. 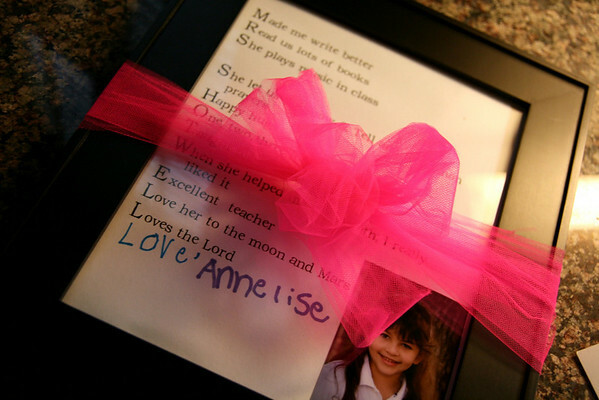 This kind of gift might just become our trademark, the thing we do because it's simple (printed poem, photo and inexpensive black frame), thoughtful and child made. 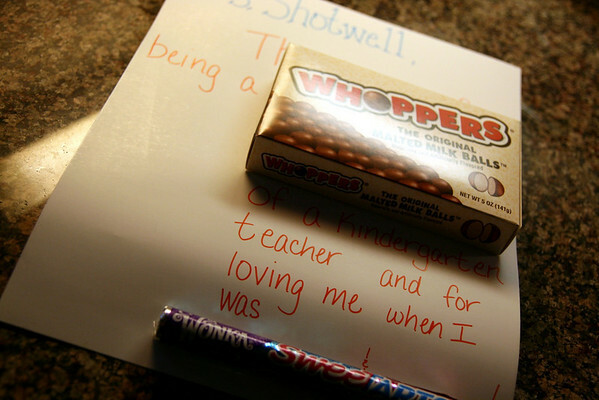 It said, "Mrs. Shotwell, Thank you for being a WHOPPER of a Kindergarten teacher and for loving me when I was SWEET and TART." Then on the back it said (I realized at 1o:30 pm I probably should have bought the bigger poster board, oh well! ), "You have Junior MINTS (meant) so much to me. I hope you have a HOT TAMALE of a summer!" Corny, I know, but Annelise liked the idea and her teacher burst out laughing this morning when she read it, so...YAY! We also gave her a gift card to a restaurant, which was kind of a stab in the dark. Fingers crossed it's a place she'll like. Now it's time to shift gears into lazy days, no alarms, no major routine, lots of pool time and general slothlike summer behavior. *Remember how I boasted earlier about getting ideal picture taking seats in the second row? Yeah. About five minutes before the ceremony started they politely asked us to move because the second row was where the graduates would be sitting. We had to relocate to, like, the sixth row, which is otherwise known as photography dungeon. Sweet. Oh my, a real cap and gown. That is the cutest thing!! Ah, I can't believe we are at the end of the school year! Those graduations ceremonies always choke me up. Grace had her's this week and Jane's is Tues. I can't believe elementary is OVER for her. Boo hoo! 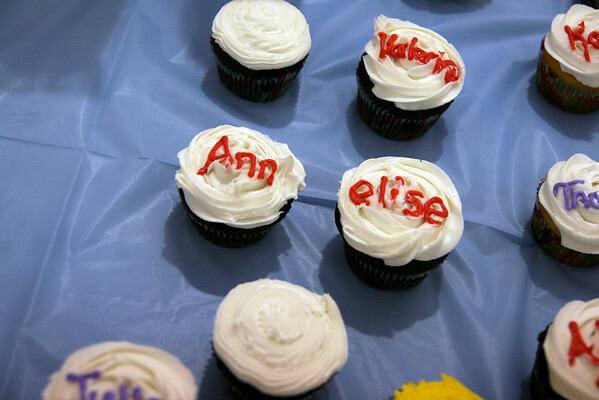 Annelise got two cupcakes with her name on them, that's just too awesome. Her dress and mary janes with the cap and gown are so cute and love the cards/gift ideas you came up with!